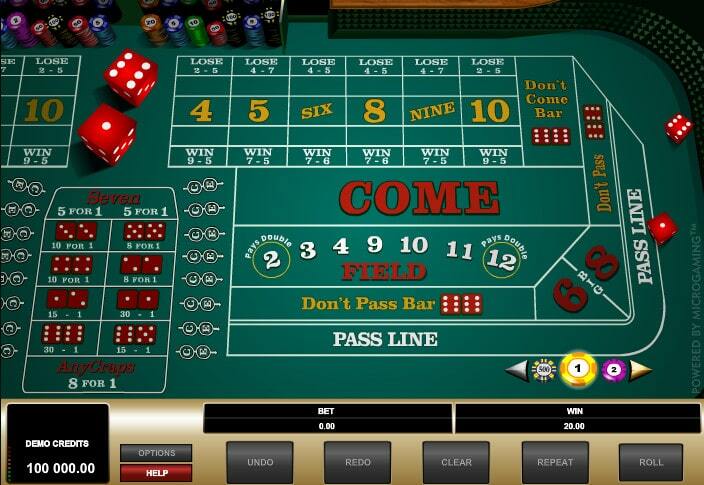 Craps as a game often falls under the radar across online casinos. It is overshadowed by roulette, blackjack and many others. This is because Craps is a not as easy to get into as its ranking brothers. At the first sight at a live game of Craps, you’ll be baffled by the odd terminology, table setting and flow of gameplay. It pushes away casino newcomers, who would much rather sit at a roulette table. It's because of its welcoming allure and simplicity of play. Why should you bother grasping the basics of this dice game, then? The answer to that is simple and much-welcomed. Craps feature one of the lowest house edges across all casinos games. One that in certain situations comes down to an absolute zero. What's more is that once you’ve accustomed to the game and gotten a grasp of its basics, you’ll grow to like it. It's through the unique and entertaining gameplay it offers. Not to mention the high probability of profit. We may have instilled some fear in you that Craps is over-complicated. It might look impossible to grasp but not if we take it one step at a time. The game has many bets you can place, but there is one predominant bet called the “Pass”. You can start by learning only a few types of bets. Then you can progress onwards as you feel more comfortable with the flow of gameplay. Before we start examining the various types of bets you can place, let’s take a look at the very basics of craps. In simplest terms, the shooter is the person who’s rolling the dice. There can be only one shooter per round, but everyone can play in each round. Every other player will bet on what the shooter is rolling. Every player besides the shooter can place various types of bets before the Come Out roll (can be also constituted as the “first roll”). The shooter can either make a Pass or Don’t Pass bet. You’ll see these words embedded on every Craps table. They change often throughout the course of the game. If the Come Out roll still hasn’t been placed, the table will show as Off. The shooter needs to roll a 4, 5, 6, 8, 9 or a 10 in order for the table to show as On. To get a better understanding of this, we’ll need to start looking at the various types of bets you can place. Let's start from the simplest ones. The Pass Line bet is the most common one. It's simple to grasp and beginner-friendly type of bet you can place at a Craps table. This should be your starting point when you sit down to play for the first time. It gives one of the highest odds, as well as solid returns – perfect for the new player. When the table is set as Off that means that the Come Out roll still hasn’t been made yet. This is when you can place your Pass bet on the Pass Line. You’ll win your Pass bet 1:1 if the Come Out roll results in a 7 or an 11, but you lose if the roll is either a 2, 3 or a 12. As we mentioned before, if a 4, 5, 6, 8, 9 or 10 is the result of a Come Out roll. That number is called The Point and the table is set as On. In this scenario, you will not win or lose yet, but you’ll wait for extra rolls by the shooter. The shooter will keep rolling until the Point rolls again or a 7. If the Point number rolls again, you will win your bet at 1:1, but if the 7 comes first then you lose. The house edge in Craps can be looked at in various ways. This is because many bets in Craps can push and are not resolved within a single roll. It can be calculated according to bets made with or without counting pushes or per roll. We take the house edge per resolved bet and divide it by the average roll number. The house edge for a Pass Line bet per roll is 0.42%, while it stands at 1.41% per bet made and bet resolved. We’re already seeing the lucrativeness of Craps. It's one of the reasons of its popularity among seasoned casino players. You can be one of them, and by reading on you’ll get a grasp of the most fundamental types of bets. It will help you when you start playing for real money. This type of bet is usually frowned upon in casinos. Most of the time you’ll be betting against every other player who deviates from the essence of this game. The fun of Craps is also in its social factor. Players will make the same or similar types of bets while grouping up against the dealer. Getting to the bet itself, you’ll conclude that this is the opposite of a Pass line bet. If the Come Out roll is a 2 or a 3 you will win, but if it results in a 7 or an 11 you will lose, whereas the 12 is a push. If none of the mentioned scenarios occur, the dice will keep rolling until a 7 or the Point is rolled. If the 7 comes before the Point you will win, but lose if the Point comes first. The Don’t Pass bet is not the exact opposite of a Pass Line bet. It is why the house edge is a bit different; 0.40% per roll, 1.36% per bet made and 1.40% per bet resolved. You think the odds are low enough as it is? The next bet we’ll explain will definitely attract your attention even more. The Come and Don’t Come bets can also act as a starting point. That's until you start learning the many advanced types of Bets in Craps. This is because they don’t differ all that much from the Pass and Don’t Pass line bets. Their advantage lies in the fact that you can place them any other time besides the Come Out roll. When making a Come/Don’t Come bet, the following roll regardless of game state will be constituted as a Come Out roll for you alone. Yet the rest of the players and current flow of game play will not change because of it. To better understand this bet, you can refer to the Pass Line bets’ explanations. A bet with 0% house edge is almost unheard of in a casino, but Craps is the game boasting it by placing a bet on The Odds. Of course, there is a slight catch, which is that casinos won’t allow you to place too high of a bet on this field. Usually you’ll be able to place a bet up to X5 times the value of your Pass Line bet, but exceptions to this rule do apply. The Odds can only be placed after the Point has been marked e.g. after the Come Out roll concludes and the table is marked as On. By placing a bet on The Odds, you are betting that the Point will come before the 7 does. If the Point is 4 or 10 the bet pays 2:1, if the Point is 5 and 9 the bet pays 3:2 and if the Point is 6 or 8 the bet pays 6:5. This type of bet is also referred to as The Odds. Once again we have an opposite bet of the previous one. If by Taking the Odds you are betting on the Point coming before the 7 after a Come Out roll, by Laying the Odds you’re betting on the 7 coming before the Point. Just like its counterpart, this type of bet comes with 0% house edge in all scenarios. The payouts are a bit different as you’ll be paid 1:2, 2:3 and 5:6 for a 4 or 10, 5 or 9 and 6 or 8 – respectively. This bet also has a limit on how much you can stake on it, up to X5 of your Pass Line bet being the most common. By taking a look at the Craps table, the first thing you may notice are the big numbers at the top. The 4, 5, SIX, 8, NINE and 10 – these numbers are the Place numbers. Notice how the 6 and 9 are marked with letters instead of a plain out number. This helps to avoid confusion about which number players are seeing. The table can attract many people at the same time. This is something which can happen quite often at a land casino. Of course, for the sake of originality we can see this layout online as well. There is no much difference between Place and Taking or Laying the Odds. Although the house edge does differ. Also, the odds are a bit lower. To keep it simpler, we’ll illustrate the house edge per individual bet made. As you scroll further below you’ll come across a table that shows the house edge in all scenarios. It includes pushes and per bets resolved. The house edge differs in this scenario as it is a bit lower. The discrepancy between the 6 and 8 and 4 and 10 isn’t that large. To “compensate” for this the payouts are smaller. In this case we’re demonstrating the house edge per bet without counting pushes, rather than per roll. Craps gives a lot of betting options. While the house does matter in the long run, betting Place to Win on a 4 and 10 can be a way to accumulate “short term” wins. The house edge is the highest, but it is still 1.67% – which is still low in the grand scheme of things. These is another type of bet, identical to the previous ones (Odds & Place). It doesn't need that much explanation, as the only difference they offer is the lower house edge. Because of that, you will have to pay a 5% commission to place them, be it pre-bet or if you win only. The latter being the better of the two. The Buy Bet is identical to Taking the Odds and Place to Win. The Lay Bet is identical to Laying the Odds and Place to Lose. Considering the house edge discrepancy and the fact that you’ll have to pay commission on a 4 and 10 bet only after a win it is worth to place a Buy or Lay bet over a Place or Odds bet on these numbers alone. When we say the bets are identical, this means identical excluding the commission you have to pay for it. Whether the risk of losing your commission, as it’s not refundable, for the better house edge is worth it is up to you. As we said before it’s always better to Place to Win/Lose and Take/Lay the odds on 6 and 8 and 5 and 9. So far we’ve covered bets that have a miniscule house edge. Some which are even lower than Roulette and Blackjack. If you’re looking to up the ante a bit, take a look at the following bets which pay out more in some cases. Of course the risk is greater to boot. To explain this bet, we’ll need to cover what a Hard Way actually is. It means that whenever a number is rolled, it was as a result of both the dices rolling an identical number. You can only place Hard Way bets on 4, 6, 8 and 10. If the two dices show 5 and 5, then that’s a Hard Way 10. If the dices show 6 and 4 – that’s an Easy Way 10. By placing a bet on a Hard Way number, the winning condition is self-explanatory. You win if the number you bet on is rolled Hard Way. Yet if the 7 comes first OR the same number is rolled Easy Way, you will lose. As you can see, the odds are quite stacked up against you. Not only are you betting on an unlikely scenario, there are two situations which can render your bet as lost. This is why the payout for this type of bet is quite larger in comparison to most others. In this scenario, we’re displaying the house edge per bet resolved as seldom will you see this bet resolved after a single roll. We need to illustrate the much higher house edge in comparison to the previous bets we mentioned. The Hard Way 4 and 10 pay 7:1, although as is the case with the 6 and 8 exceptions do exist across various casinos. These bets are high risk ones but also high reward in the most general of terms. But in reality the risk isn’t that high as say, betting on a single number on a roulette table which would pay 36:1. In Craps, we’re seeing a much better Risk : Reward ratio. In this scenario the 9:1 pay out more than merits the average house edge of around 5%. We can’t always compare Apples with Oranges, but this is a mere example of why Craps is so popular. You just need to take the time to learn the basics. Placing a Pass Line or Come bets in Craps is usually only recommended before the Come Out roll. Past that the laws of diminishing returns put the house edge much higher than it initially is. Placing this type of bet is called the Put bet, in which the house edge ranges between 9.09% and 33.33%. You may ask yourself why would you place a bet of this type. The answer is that because you can combine it with a Taking the Odds bet. The house edge of a Put bet when combined with Taking the Odds is 1.52% on a 6 and 8, 4.00% on a 5 and 9 and 1.67% on a 4 and 10 – on each bet resolved. We’re already delving into almost needlessly complicated territory. These types of bets are the reason why Craps has its reputation of being hard to get into. Of course, almost every type of bet exists for a reason and has its niche uses. As a new player or even once you’ve started mastering the game, placing a Put bet can be quite redundant. We’ve listed the house edge per individual bet along with every type of bet. You can refer to the table below for a full breakdown of the house edge in various scenarios. It includes all types of bets that can take multiple rolls to resolve. We will, of course, start from the simplest types of bets and progress upwards. The chart above details all the bets that can take a multitude of rolls to be resolved. There are also types of bets in Craps that are resolved on the following turn no matter what happens. We’re talking about the Field Bets and the Proposition Bets. Placing a Field Bet means you’re wagering that the next roll will be one of the following: 2, 3, 4, 9, 10 11 or 12. Given the nature of this type of bet, the payout for the most part is 1:1, but the 2 and 12 are known to pay out a bit more. It all depends on the casino in question. Proposition Bets are the riskiest Craps bets you can take. They also resolve on the following turn. In general, you will be able to bet on a certain set of numbers, such as 2 and 12 or 3 and 11. Prop bets can pay out from as high as 33:1 to as low as 4:1. The house edge will be pitted against you here. If you’re ever feeling lucky or are looking for a risky bet, the option is there. With such a complicated game, you’d think that there would be an endless source of game winning strategies at hand. The reality is quite the contrary, as the most refined playing strategy for craps is quite easy to grasp. You want to lay the odds as much as possible in combination with a Don’t Pass or Don’t Come bet. In contrast, you can also take the odds in combination with a Pass and Come bet, but the latter is less lucrative. This type of play ensures the most optimal balance between risk and reward. This is why you should follow it – especially as a new player. Craps is a game loved by many. Its deep intricacies and the atmosphere revolving around the table is hardly matched elsewhere. Contrary to popular belief, the game is easy to get into. Yet, it is quite time-consuming to master. Luckily, even newbies can play and enjoy the great opportunities Craps offers right off the bat. Hope we’ve helped you get a grasp of this astounding table game.